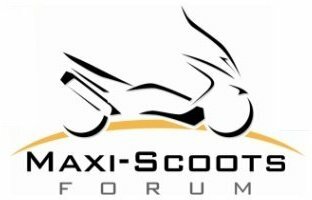 Since we will have extra room to bring things just name it if you think of something we need. I know extra lawn chairs and a tent canopy are on the list so far. 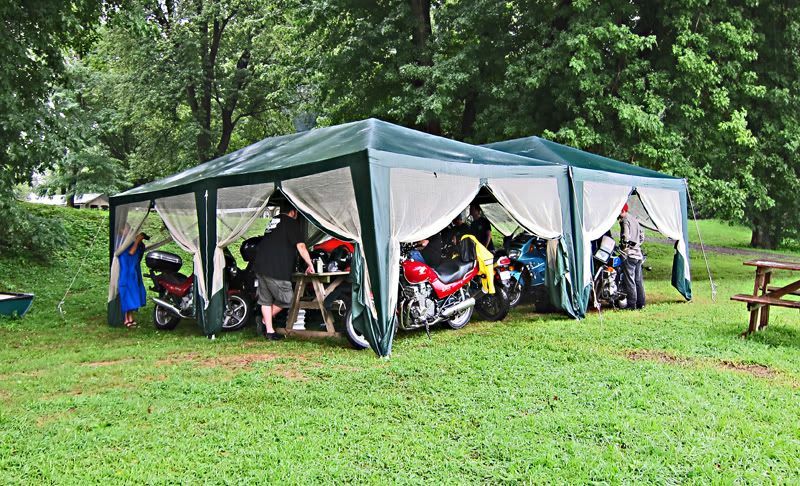 Not it's intended use but the two tent canopies that the Michigan riders brought last year were a make shift bike garage. We had so much rain the day before I rode out for home I was glad to have a dry bike before the journey. I will look for those, Dan. As far as a communal lounging area the campground has a large tent canopy with picnic tables right at the parks entry. The canopy garage was just a nice convenience last time but not a necessity. Hopefully we will not get rained on! We have a 12x12 canopy with screened sides that will be on board. We'll bring a car and at least two bikes to Lewisburg, so I plan to bring a 2 HP, 4 gallon air compressor, air chuck with gauge, and most of my air tools (impact wrench, ratchets, drivers, misc. inflation tools, etc.) and plenty of air hose. We could use a transom-back canoe, and maybe a small trolling motor if you could squeeze them in. Anybody else bringing an RV or camping equipment? 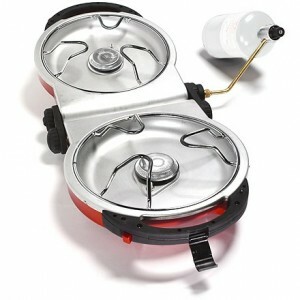 We have a fold-up camping stove which is great for making breakfast on a summer morning. I'll add that to our list of items to bring. Dave you shouldn't pack that until the day before you leave, otherwise your jokes will go stale. Plans for suppers will be loose. People can search out food on their own or we thought would be fun to just gather stuff and grill and want not? I know lunches will probably be out on the road Friday and Saturday for sure. Thursday/Friday/Sat night I am up for just casual hanging out and grilling etc. Breakfasts Stu & I plan to have coffee available. I am going to get some stuff to easily make in the RV for everyone. There is a great little diner for breakfast just up the road from the campsite. Very cheap too and the food was good. Spoke to Phil he will have some tools etc. We have an air compressor/tire plug kit that is a plug in charge set up, we will have that on the rides. I will bring extra blankets and some chairs. I'm so excited I'm about to burst at the seams!! Maggie -- if you are that excited and about to burst at the seams -- bring a couple extra pairs of pants. I'll take some Bryer's Chocolate Cookies & Cream Ice Cream. I'm sure John B will have his with him also and the wit of the MasterSargent and Dan, so is Stormin Norman comin? John B said a couple of weeks ago he can not make it. Norm had mentioned he would be in Brazil with his new bride to be.